A brilliant set of stickers to make bath time more fun! We loved that these were mess free and easy to use, the pieces were colourful and well designed and the children loved the look of them (especially the sharks). There were lots of pieces which really promoted our testers creativity and and we loved hearing the stories that they created. Imaginative play also helps children act out and make sense of situations, which is important for personal, social and emotional development at this age. When playing with other children and adults, there was also opportunities for children to develop their related vocabulary. It doesnt just have to be played with in the bath; there is a colourful board included for play outside the bathroom and other surfaces could also be used. The size of the product also makes it a good toy to take on holiday! Step in to the world of a Stickabouts® Pirate Ship. 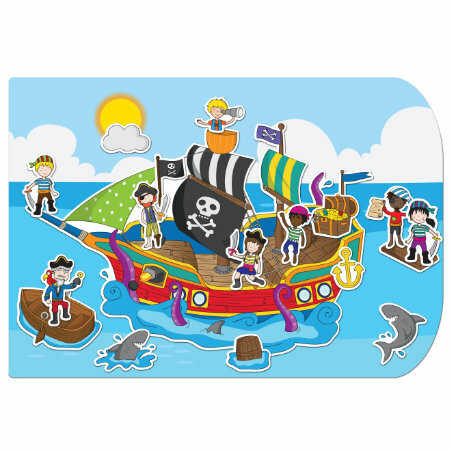 Made from the popular Stickabouts® material, there is a big Pirate Ship scene piece with matching character and item pieces such as pirates, sharks, and treasure! Stickabouts® are glue free stickers that are washable and reusable. Meaning that if they ever lose their stickiness simply wash the pieces with water and they are back to normal! The Pirate Ship is great for creative play in the bath or bedroom  or any room with a smooth surface that it will stick to. Children will love placing the character and item pieces onto and around the large colourful scene, creating their own fantasy stories and keeping them entertained for hours.